Bleuet is a unique renovation for the site, as it's the only gite to have never previously been inhabited. This provided a blank canvas in which to design and build a fantastic living space that is simple, efficient and well thought out. 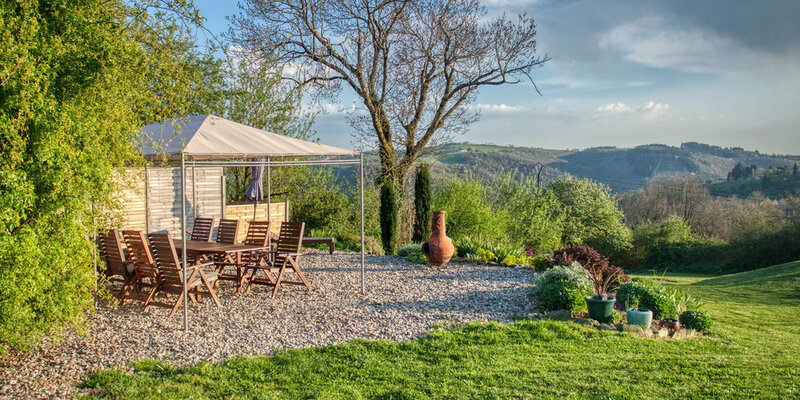 Situated a little away from the other two gites, Bleuet benefits from a clear view over the pool area and the Viaur valley beyond. The property is accessed from the private courtyard and offers a large gravelled area with table, parasol and set seating for 8. There are 3 sun-loungers and a barbecue. The space offers one of the best locations on site to view the marvellous sunsets, while enjoying a glass of local wine, or two. On entering the property there is ample hanging space for hats and coats, and a fridge intended for drinks. The first room leading off the entrance area is bedroom 4 (5m x 3.5m), known better as 'the kids room'. Here you will find a large room containing 2 sets of bunk beds, perfect for large families or 2 families sharing where every night becomes a sleep-over. The room has plenty of floor space for playing games. 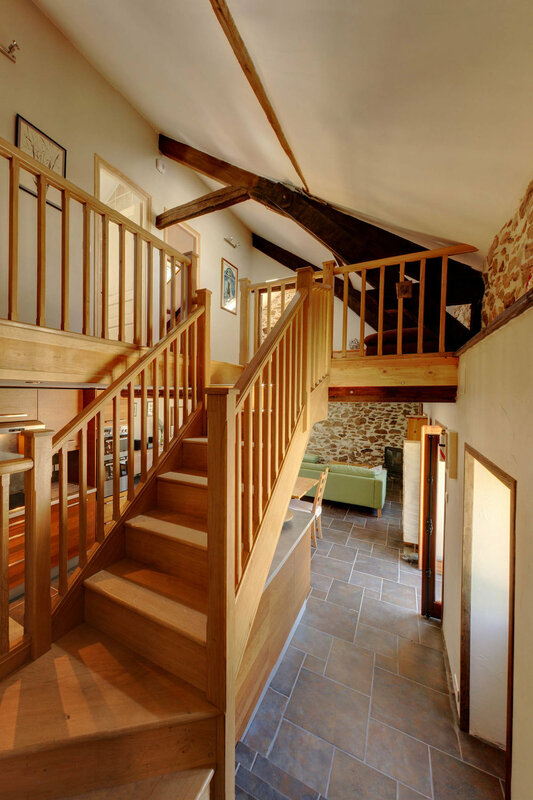 Moving further into the property you catch your first glimpse of the bespoke, oak staircase leading to the first floor, but continuing on takes you into the main living space complete with a log-burner (not pictured), ideal for the colder months of the year. The architecture of the original building lends itself perfectly to an open plan design, with the efficiently planned and well equipped fully fitted kitchen (3m x 3m) at the heart of the property. Why be stuck away in the kitchen preparing that fantastic meal when you can still participate in the social aspects of your vacation. The kitchen comes with double electric oven, halogen/induction hobs, microwave oven, refrigerator, freezer, and the ever important dishwasher. The kitchen is well stocked, so you'll have no trouble finding the right utensil, pan or dish for any occasion. We also supply basic materials such as cling film, aluminium foil, herbs and spices, so you aren't having to spend unnecessary money on items that will get only a little use during your stay. There is also a good selection of plastic plates, cups, etc. for the children, picnics, or drinks around the pool. The dining area (6m x 3m) offers a large dining table with set seating for 8, but accommodates 10 comfortably. Beyond, you'll find the seating areas (6m x 3m) arranged with 2 armchairs that are ideal for reading or a chat over coffee, and the L-shaped sofa for games and television viewing. Satellite television is available, currently offering UK free-to-air channels plus many more, together with a DVD/Blu-ray player and a small selection of films. There is also a dedicated CD player equipped with an iPod dock. There's also a number of games to play, and a bookcase with a selection of reading material, including some books on the local area. Also on the ground floor there is a shower room (2.7m x 1.6m), finished to a high standard and complete with WC. It's ideally located for showering after a dip in the swimming pool. Ascending the oak staircase you reach an open landing area, another favourite space for the children to play or relax, but also offering a light and airy space - no dark corridors here. From the landing you have access to the 3 remaining bedrooms and the main bathroom. The master bedroom (6m x 3m) over-looks the garden, pool and gravelled area, and benefits from the evening sunlight. The room contains a double bed, 2 bedside units, a wardrobe and a chest of drawers. A fan is also provided for those hot summer evenings. The exposed stone walls and original features come together to produce a delightful room. There is plenty of space to put a cot or child's bed in this room, available on request. Bedroom 2 (6m x 3m) is located at the opposite end of the floor and also offers a double bed, 2 bedside units, a wardrobe, a chest of drawers, and a fan. The room benefits from the morning light, perfect for those early to rise, and often offers a quiet retreat for an afternoon nap. 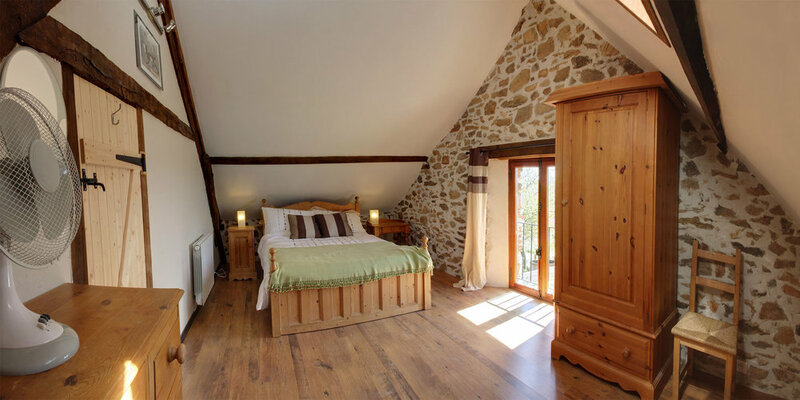 Again, the exposed beams and stone walls add to the character of the room, even if a little vertically challenged! Bedroom 3 (3m x 3m) is a single room, ideal for Grandma and that older or younger child who would prefer their own space rather than sharing. It is also perfect for a baby in a cot if necessary, away from the parents room but still offering a bed for when that child needs extended attention during the night. 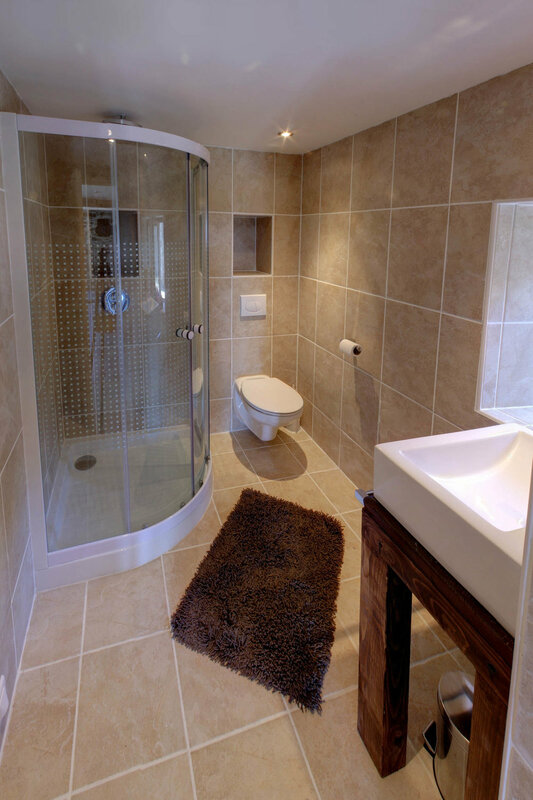 The main bathroom (3m x 3m) is also finished to a high standard and is fully tiled. When illuminated by the morning sunlight, it's a refreshing room to start the day in. Bleuet benefits from ceramic radiant heaters through the building so will be warm and comfortable throughout the colder months. Ideal for spring and autumn breaks and very cosy for those winter breaks. And the log burning fire in the main living (not pictured) area gives off ample heat when you fancy a cosy night in. Bathing and pool towels are provided free of charge. Fresh bed linen is offered weekly for those parties staying long than one week. Laundry facilities are provided in a separate building and shared between the 3 properties. There is plenty of line space for drying towels and clothes. There is a communal games store on site that is available to all guests. You can currently enjoy a few games of table tennis or table football to pass the time. Wireless internet is also offered free of charge on site, although this is rural France so connection speeds leave a little to be desired! It should be more than adequate for checking your email and browsing web sites. Access from inside Bleuet currently requires good 'line of sight' to our antenna, which usually works best from downstairs. In order to capture as much of each room as possible in a photograph it is necessary to use a wide-angle lens and rooms may sometimes appear larger than they are. Please refer to measurements for clarity. If you have any questions about Bleuet, please don't hesitate to contact us and we will be glad to help.